Kirby: Nightmare in Dream Land is the 2002 remake of Kirby's Adventure for the NES. Kirby wakes up to find out that the dreams of Dream Land have disappeared! King Dedede has stolen the Star Rod from the Fountain of Dreams and it's up to Kirby to defeat him and his 6 minions to get it back. Fans of the original game praised Nightmare in Dream Land for its improved graphics and audio quality while also chastising the game for removing innovative touches that pushed the original game to the limits of the NES hardware. Best 100% time: single-segment 0:53:31 by Nicholas 'Sir VG' Hoppe on 2008-03-31. What? You can't sleep? Kirby! Save our dreams! Kirby: Nightmare in Dream Land was a major learning experience for me, as a gamer, and as a speed runner. There are really three things I learned while I was working on this game. First, I learned the truth about nostalgia. Kirby: Nightmare in Dream Land is a remake of the NES game Kirby's Adventure. When originally deciding to do this, a lot of people asked for the NES version instead. While at the time I didn't own it, I do now (both on NES and on the Virtual Console). But even now, I still will NEVER speed run the original version. The reasoning is simply put - the GBA remake is 1000x better than the original. Now, I'm not one against old school gaming. I'm a classic gamer. I actually searched around for an Atari 2600 just because I had one as a kid and had to have it again. I love playing old NES and SNES games (some of my favorite speed runs I've done include some 16-bit games). But Kirby's Adventure...well, I hate it. The reasons are primarily 2 things. First, the controls. The controls, while as simple as they are, are poorly done on the NES, and often times unresponsive. The GBA is smooth. If controls were clothing, the GBA would be like silk, and the NES...sandpaper. The second, is lag. The GBA handles everything the game throws at it without issues. The NES suffers from HORRIBLE lag EVERYWHERE. Yes, I understand that the NES is a weak console, but HAL could have handled things better. There have been more impressive games on the NES/Famicom that have had zero lag (like Gimmick! for one). Yes, the GBA version cuts out some nice things, like the multi-colored switches, the twirling butter building, the star ride through the woods, the HAL easter egg (check out YouTube for this one. It's an interesting easter egg), but it ain't worth the frustration of running it. Or even playing it, really. Yes, Kirby's Adventure brought the all important abilities into Kirby's life. But in reality, the old TV commercial was better than the game at times. It's been nearly a quarter century since I picked up my first game and I know times have changed. It's sad to see too many gamers sucked into "prettier is better" but Kirby has taught me one thing - "Nostalgia isn't necessarily better either. You have to create a game that works on all levels." Enjoy classics. Enjoy new games. Just remember that you can't depend on one factor to call a game "the best". Those that are truly the best excel in all fields. But most importantly, whether or not you're speed running or casually playing, there's one thing you must NEVER forget. The second thing I learned was control. I spent some time in late 2006/2007 running Kirby, completing 9 iterations of it. In February 2007, I sent off my last attempt, but was soundly rejected. Crushed, I didn't touch Kirby: Nightmare in Dream Land for another year. But then, another Kirby thread showed up in February 2008, with somebody asking people not to "steal" his run. I laughed, then found my old thread out of my list of bookmarks, so the runner would have a benchmark. It's not the first time it was referenced - it was referenced over at TAS Videos in rejecting a TAS of the game. Suddenly, people perked up. What happened to my run? Why was it rejected? Video please! So I decided to tickle people's fancies - I posted the video over at YouTube. A few ideas were spouted out, but a lot of comments saying that it was good. So I dug my game out again and started playing. Not having touched the game in a year, yeah...I did crappy on the first run. I didn't even make it through Butter Building without running out of lives. But in 3 days, I went from that, to getting a speed run within 3 seconds of my old time. I kept plugging away, and managed a new improved run at the end of February. I was indeed quite surprised at the fast recovery rate, but even with all of the improvements, I was still rejected. Needless to say, I was quite upset. I was even more so when v11 was suffering from "pre-submission prejudice", so I wasn't very inclined to show or submit it. One thing I noticed that I was doing (at almost a subconscious level) was making comparisons of where I was in tune with the music. If I fell behind, I began to rush and thus started making careless mistakes. One day, on a whim, I turned off the sound from my speakers and listened to a couple tunes on my PSP (incidentally, they were Mario and Luigi Circuits used in Super Smash Bros Brawl). By this method, I completely lost the ability to hear the game, and thus the mind lost its ability to compare. I was now able to focus more on my hand-eye coordination, and less on ear-eye coordination. Thus, began a new chapter in my speed running career. After v11 was completed, I loaded up my PSP with a bunch of tunes, and dubbed the folder SPEEDRUNNER!!! and began running. My mind was still fighting the change and adapting to things took some time. I came close at several points, but didn't quite get the run I wanted. Finally, one night with my wife by my side, I was facing frustration, but she encouraged me to try one more time. Good thing I did - because I managed to finally pull off the run I wanted. At the end, we celebrated (and laughed at the outtake run at the beginning of the video, in which I smack face first into the first Waddle Doo of the game! ), and I finally felt a bit of a peace inside. While I know I won't be able to always use this technique (as some games face enemy position sensitivity which can only be determined by sound), I hope to further enhance my skills this way, to improve myself speed running, as well as normal gaming. Around the time that v10 was rejected, I found out that an important person to my wife and me had passed away. Now, granted I am not a very religious person, but when I heard that my wife's minister (who had performed our marriage ceremony) passed away, I was saddened. I felt a bit sick from this, but did make it to his funeral visitation. When I picked up a program as I left, one thing caught my eye. During the time he was in the hospital, the doctors reported always enjoying going to work with him and visit him, as he had always kept his sense of humor and had a smile on his face. Now, he didn't die from some minor disease - this was leukemia. He knew that his time was short and yet didn't let that fact keep him down. He kept on going - moving forward. So I knew, if for nobody else but myself, I had to press forward, even when things felt impossible. I had to relearn the lesson I had learned long ago when it came to speed running - never do a run for anybody else, always do it for yourself. Don't worry what others will think; always care about what you feel. And even if others fail to accept it, don't take it as defeat. Take it as a new challenge. This lesson though, I have a lot yet to learn. This is, of course, the hardest lesson for anybody to learn. It doesn't matter for what task it's for, the lesson is always painful and easy to forget. And for this, I must keep working on it, each and every day. To anybody who's made it this far through my notes, I congratulate you for putting up with an old gamer's rant. And I thank you for helping me remember the lessons that I know I must learn and relearn. Thanks to everybody at SDA, both staff for running the site, and for everybody who cheered me on as I returned to this challenge, or offered advice. This run is dedicated to Pastor Richard Reynertson. Though I knew you for not a long time, and though my mind is slow and my views different, you always treated me with kindness and respect. And for that, I thank you. This run is Copyright (C) 2008 Nicholas "Sir VG" Hoppe and is allowed for downloading and private viewing. Permissions for hosting this run have been granted to Radix and Speed Demos Archive. Public viewing of this run is prohibited without prior permission from the creator. The selling or distribution of this run for profit in any way, shape, or form including (but not limited to) selling on eBay and television for profit is prohibited without prior permission from the author. Video hosting sites (i.e. YouTube, etc) may host this video in part or in full, as long as full permission is granted from the author. Any violation of the above listed may result in legal action. 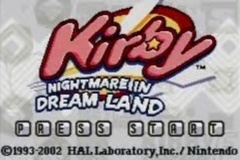 Kirby: Nightmare in Dream Land is (C) 1993-2002 HAL Laboratory, Inc./Nintendo.